Here are the five of the Best SERP Tracker Tools in 2019. I choose to display top 20 alone to write this post, but you can check out how top 100 results looks here. SERPWoo shows the daily movements of your site in a graphical interface; thus you can get a clear idea about your site movements. 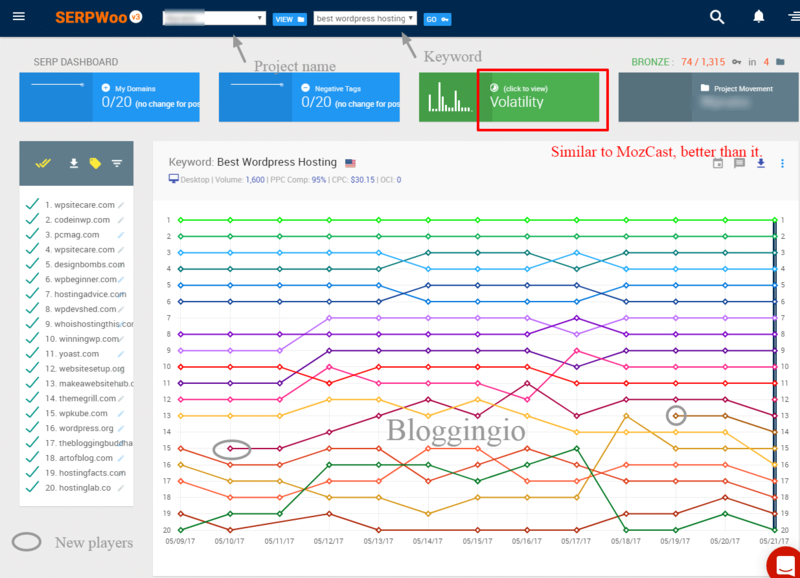 From the above image, you can see SERPWoo shows all the top 20 website and its movements.​ If a website jumps high in ranking, I watch them closely and if I can replicate any other backlinks like guest posting, Forum link or even commentluv backlink. If it's possible, I will do before anyone else thus securing my position or even climb to some higher positions. SERPWoo also incorporates third-party data from Majestic, OSE to make the SERP tracker better than others. Not on all Web 2.0 works. Even if some Web 2.0 works for some niche, it won't work for other niches. For example, subdomain.wordpress.com ranks well for Android related niches, but it won't work well for weight loss niches. The best way to find the Web 2.0 that ranks for​ your niche: Choose some 10-15 keywords, add them to SERPWoo. When the tool starts displaying top 100 results, you can see merely 4-5 web 2.0 alone ranks at some positions #30 to #60. I choose ​a year backdate and I can see the top 100 results. This helps you to know how authority sites are dominating SERP results. Serpstat is the another tool which helps you to track a keyword with upto 100 domains. Serpstat is a complete SEO tools that comes with Competitors analysis, backlinks analyzer, rank tracker and SEO audit. 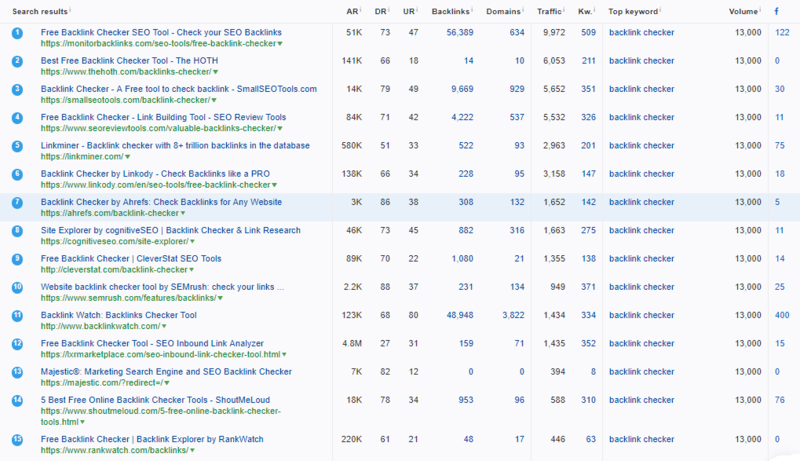 This is how the quick view of ranking updates looks in Serpstat. 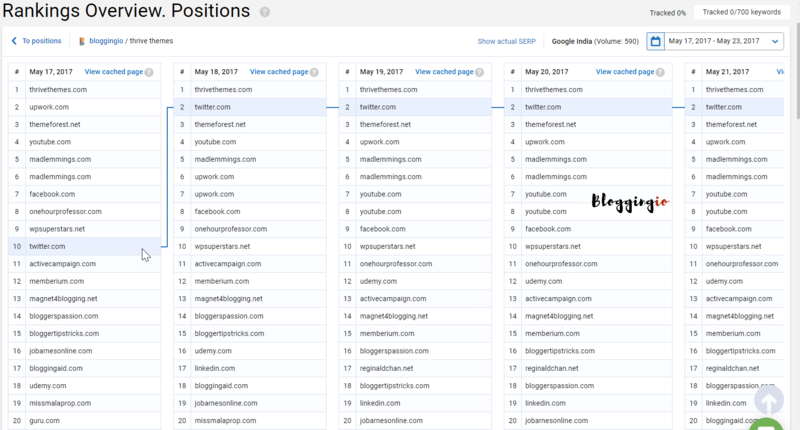 As did for SERPWoo, I took a screenshot of top 20 domains tracking via Serpstat for tracking up to 100 domains, check this link. The Significant difference between these tools are SERPWoo comes with a graphical view while Serpstat shows results in a table view. As already said, ​Serpstat is a complete SEO tool, I talked more about Serpstat in the Serpstat review and also recommended it as the best seo tool. So I'm skipping those parts and talk about Pricing. Since Serpstat is an SEO tool, it costs more and I recommend Plan B which comes with $69/month and track up to 700 keywords. If you don't know, I bought Serpstat for three year license and I got 40% Off. So if you get Plan B for three years, the monthly cost ​will be around $40. Ahrefs’ SEO toolkit has a built-in SERP checker. Just enter any website or web page in Site Explorer and head to the Organic Keywords report. Here, you will see every keyword the website or web page ranks for in the top 100 search results. That way, you’ll get a clear idea of what it takes to rank for your target query and how much you can benefit from it. Thanks to the SERP position history, you can see which results have been volatile lately. Such keywords often present a good opportunity to rank. The tool is perfect for tracking SERPs locally, across 170 countries to be more exact. The cool thing is you don’t have to bother switching between different IPs or proxies. SERPWatcher was an another cool tool from Mangools, team who developed KWFinder (Check KWFinder Review), the finest keyword research tool in the market. SERPWatcher bets big on Dominance index. Based on your ranking positions and estimated visits, SERPWatcher Dominance index shows how well your site is performing in search results. I already wrote an detailed review on SERPWatcher, and you can learn more features of the tool along with the guide. SEMrush includes an impressive position tracker tool that comes with daily ranking updates, both desktop and mobile locations can be tracked, even further one can track Local SEO rankings with SEMrush. The only downside, the tool won't available individually, all you need to get the entire SEMrush suite if you don't use other features. You can always use our SEMrush Free Trial for 2019 to sign up and test drive the tool to look whether they suits your business. SERP tracker is the method to check the rankings of your website for any given keyword. Suppose your keyword is "SEO tools" and wrote content for it, the tools identifies the position of your website on Google Search results for the keyword "SEO tools" and then shows you're at position #15 or #30 or something like that. 95% of tools have this feature, and they call it as SERP tracker. But I say, all those 95% of tools are traditional SERP keyword tracker tools. Let's have a look at this statement. Though they crawl entire results page, they show the position of your site alone, leaving rest of sites. What happens if the tool shows the top 100 websites ranking for a given keyword? We can monitor each and every site's movement, thus having a very good idea of how every other competitors are trying to rank for the keyword. The tools which show the top 100 results for any given keyword alone gives the complete meaning of the word Best "SERP Tracker"
The tracker that tracks the top 100 domains for any keyword. We analyzed over 50+ SERP Trackers tools and found only two tools that offer the functionality of tracking top 100 websites for any given keyword. They are truly the best SERP Trackers 2019. I was just looking for a keyword tracking solution and your review on “Best SERP Tracker” has helped me indeed. Thanks for this post. Please keep doing the great works. Thanks. Keep posting like this one.Good job! Actually, there is no low-cost SERP checker which tracks top 100 results. These are the only two options available right now. However, you can try https://serplab.co.uk which is a free SERP checker. Awesome content sir. Really loved it. Thanks a lot for sharing this knowledge.